The next of our top picks for the London Film Festival also carries the theme of children abused and communities bearing down on outsiders. It's the documentary WEST OF MEMPHIS, and tickets are still available from the BFI for both the October 13th and October 14th screenings. In 1993, three young boys were hogtied and murdered, and their bodies thrown into a watery ditch. Three teenagers were tried for those murders, even though there was precious little physical evidence and no motive, unless you believed that they were in a Satanic cult, and the confession obtained under duress from one of the accused. Decades later, and the verdicts still stood, despite the recantations of key witnesses; experts pointing out that supposedly Satanic genital mutilation was probably carried out post mortem by turtles; and what can only be called deliberate manipulation or withholding of evidence by the pathologist and prosecutor. This was a travesty of justice so obvious to everybody but the State of Arkansas, that celebrities wrote songs and raised money to overturn the verdict, and HBO produced three documentaries on the case - the PARADISE LOST trilogy by Joe Berlinger and Bruce Sinofsky. Among those celebrities drawn to the case were the couple behind the LORD OF THE RINGS trilogy, Peter Jackson and Fran Walsh. And thanks to them, we know have this new documentary, directed by Amy Berg (BHUTTO). This film redresses some of the information that was current at the time of PARADISE LOST but which later investigations proved to be incorrect, and brings us right up to date. It does so in a sober and calm style which befits the material, in a tech package that is absolutely top-notch. The first hour of the film recounts the original murders and trial, and makes the case for the innocence of the "West Memphis Three". It leaves us with a profound sense of injustice and disgust at just how shamefaced some of the prosecution's tactics were. The only reprieve is a brief moment of cathartic shock when we see an animal handler prove what a turtle bit looks like. I found this hour to be utterly compelling - interweaving vintage footage of the trial - commentary by Peter Jackson and other celebrities who got involved in the cause - and most emotionally, footage of the incarcerated Damien Echols and his wife and campaigner Lorri Davis. The second hour of the documentary then provides us with an alternate murderer - the stepfather of one of the murdered kids, Thomas Hobbs. I found this hour to be highly disturbing. To be sure, it seems like there's a lot of evidence against Hobbs. He had an apparent history of violence against his lovers and children - his daughter is severely disturbed and wonders if she was sexually abused by him - and the documentary paints a convincing picture of a man who was jealous of the attention his wife paid to her son, and spontaneously murdered him and his two friends. What I found disturbing was that, in a sense, this documentary was condemning this man in the court of public opinion rather than in a court of law. And when the documentary is telling us that previous documentaries did the same thing to another of the stepfathers in this case, but got it wrong, and caused him much suffering, I think that should give us pause. 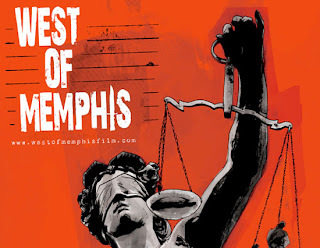 I guess the real tragedy here, and one that the final half hour of the documentary shows, is that because the West Memphis 3 eventually got out of jail on a technicality - so worn down with fighting for justice they accepted a technical guilty plea but assert their innocence - that we'll never have real closure. They won't have cleared their names truly, and therefore, Thomas Hobbs can't be tried for a crime that others have already been condemned for. Guilty or innocent, Hobbs deserves a fair trial. So did the West Memphis 3. WEST OF MEMPHIS played Sundance and London 2012 and will be released in the USA on December 25th 2012. Running time: 150 minutes. Rated R.